It is indisputable that Apple iPhone is one of the most successful gadgets that have been introduced to the world. So each time announcement of new iPhone generation makes a hot wave in the market, iPhone 8 is just a case in point. With stunning new 5.8-inch Retina display, an impressive 2800 x 1242 resolution, a minimum 64GB storage and an all-glass body, iPhone 8 absolutely catches your eyes and provides plenty space and fantastic visual experience to store and watch movies, music videos, and more on it. But for those who are obsessed with DVD collection and desperately want to play DVD on iPhone X/8, they will suffer from frustration since it’s a known fact iPhone 8 is devoid of DVD drive. Wanna make a copy and rip DVD to iPhone 8/X acceptable format for entertainment on the run? To backup DVD movie and rip to the new iPhone XS/XR/X/8, it's necessary to find a program that is qualified to copy and convert DVD into a format playable on the fashionable iPhone XS/XR/X/8. Officially, like the its brothers iPhone 7s/7/6s/6/Plus/SE/5s, etc, this new iPhone still supports playing MP4, H.264, MOV, M4V, etc. To accomplish this task, MacX DVD Ripper Pro is highly recommended for it fully embraces the audio and video formats for the fifth generation iPhone and helps to rip and copy DVD to iPhone 8 on Mac flawlessly. Still, copy protections like Sony ARccOS, Disney copy protection, CSS, etc that are put on new blockbusters are no longer a bother because this DVD to iPhone 8 ripper for Mac (macOS Mojave) and Windows (Windows 10) is able to deal with all encrypted DVDs and helps to decrypt and backup protected DVDs on Mac, making DVD copy on iPhone X/8/Plus/7s/7s +, iPhone 7/7 Plus etc without any obstacle. World's fastest DVD ripper for iPhone 8 to rip any copy protections-protected DVD movies to MP4, MOV, AVI, MKV, WMV, etc for iPhone XS/XR/8/8 Plus/7s/7 etc with 5x faster speed. 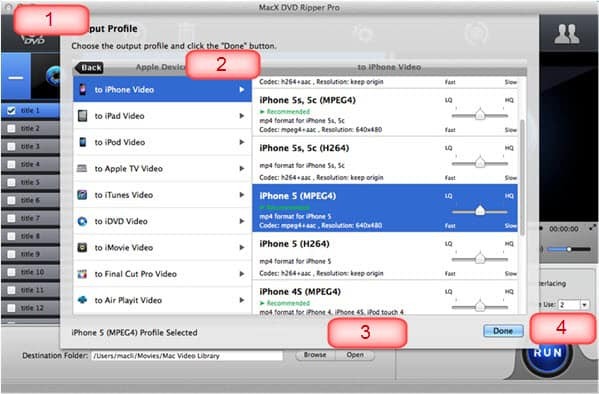 MacX DVD Ripper Pro Makes DVD to iPhone conversion quite simple. The following step-by-step guide will show you how to convert and copy DVD to iPhone 8 on Mac computer easily. After free download this iPhone X DVD ripper on Mac, or get the Windows version for PC users; import the DVD you want to copy on your iPhone 8 by means of clicking "DVD Disc" button. Alternatively, you can import files by hitting "DVD Path". Since you need to backup DVD and and rip DVD to iPhone XS/XR/X/8, choose "to iPhone" button as your output video format. MacX DVD Ripper Pro provides a simple and humanized interface. For beginners, you can simply choose the default parameter setting from the drop-down list of profiles setting. While for advanced users, you can set video and audio quality and specific parameters of your choice to make your DVD copy well on your iPhone 8 with perfect video quality and fast speed. Step 3 Choose Output Folder. You can start ripping and copying DVD to the new iPhone XS/XR/8 or iPhone X on Mac with this DVD to iPhone X/8 converter for Mac. All the tasks can be finished within few clicks at fast speed. MacX DVD Ripper Pro is also famous for its wide-range output video format supporting like MP4, MPEG, MOV, FLV, AVI, MP3, etc, which are optimized for any portable devices apart from copying DVD to iPhone 8 on Mac, thus you can simply import DVD to iPhone 7, iPhone 6s/SE/6/6 Plus/5s, iPad Pro/Air 2/mini 4, Samsung, Android, and so on. It makes your DVD collection more mobile and enables you to experience the shocking visual feast no matter you are during a long journey or on a boring flight. iPhone 6 is coming on the road! Wanna rip DVD to iPhone 6 for enjoying movies on the go? This article will show you how to rip and convert DVD to iPhone 6/7/8/X/XS/XR without sacrificing any quality. With this powerful free DVD to iPhone ripper, iPhone users can free rip DVD to iPhone and get suitable video files very easily and enjoy them anywhere. Are you still seeking for the best iPhone 8 DVD ripper for Mac? This tutorial shares you a good Mac DVD to iPhone 8 ripper, helping to rip all DVD movies to the new iPhone 8 on Mac with ease.